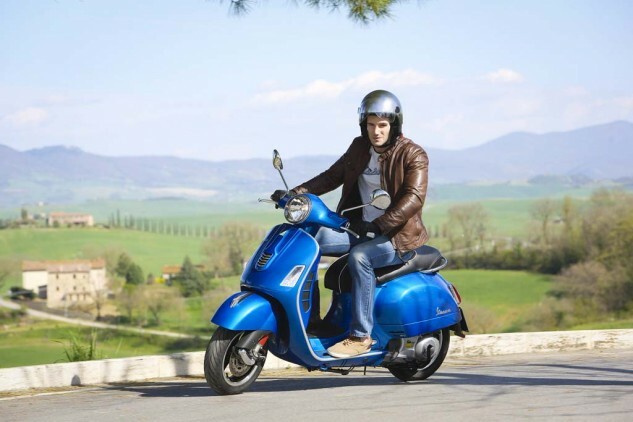 Piaggio announced new updates for the Vespa GTS, adding anti-lock brakes, a traction control system and its new Enahnced Sliding Suspension system, bringing the company’s latest scooter technologies to the largest, most powerful Vespa model. 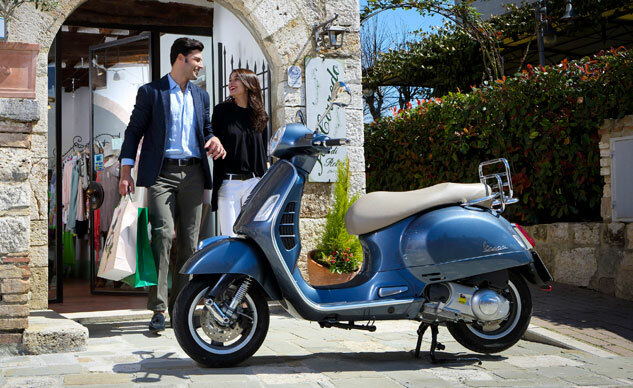 The new additions on the GTS should not be a surprise, as they have already been adopted by other new Vespa models such as the 946. Piaggio was the first company to introduce ABS and ASR traction control system for scooters, and the updated GTS will now receive the technology as a factory-installed option. The system uses sensors on both wheels, measuring how fast they spin in comparison to each other and to the scooter’s speed. The sensors communicate with a two-channel hydraulic control unit that activates the ABS if one of the wheels decelerates more abruptly than the GTS’ speed to prevent wheel lock-up. Likewise, if the sensors detect the rear wheel is spinning too fast compared to the front wheel, the control unit acts to prevent sliding. The ESS system was first introduced on the new Primavera and Sprint models. 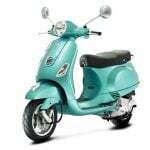 It keeps the traditional Vespa single-sided suspension look but the shock absorber is now fixed to the trailing arm with a hinged pin instead of being bolted on rigidly. 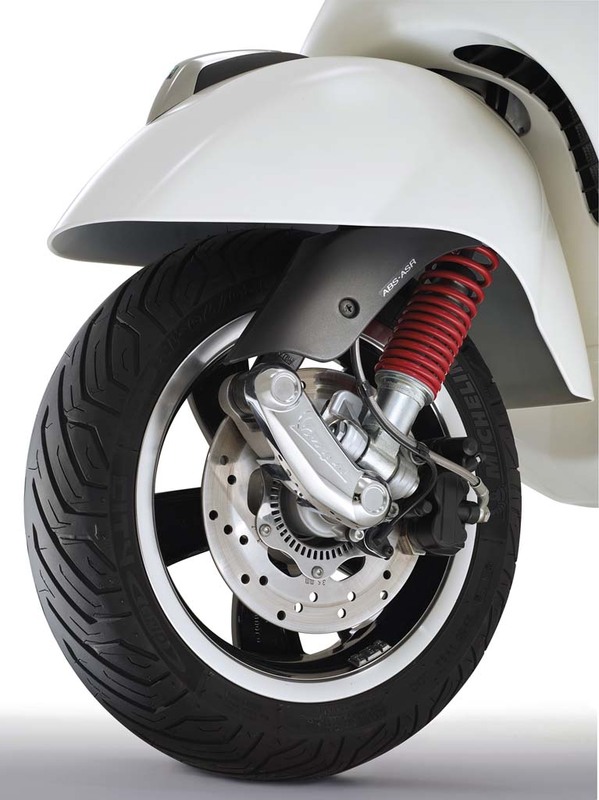 Piaggio says ESS improves rider comfort by better absorbing road bumps while cutting sliding friction in half. Twin shocks with four adjustable preload settings provide rear suspension. 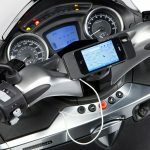 Also new to the GTS is the smartphone-compatible Piaggio Multimedia Platform. Rebranded here as the Vespa Multimedia Platform, the system connects smartphones to the on-board electronic system, allowing for real-time display of vehicle and engine speed, horsepower, torque, fuel consumption and other data. The smartphone can also be used as a GPS navigator. On ABS and ASR-equipped models, the VMP system can also function as a tire condition monitor, keeping track of air pressure and tire wear. Also new is the USB port located in a compartment behind the leg shield, useful for keeping smartphones or other small electronics charged. Visually, the GTS keeps much of its traditional look but with the updated looks matching the Primavera including the new “tie” styling on the front shield. The turn indicators now use clear plastics while the rear light assembly now has a chromium frame to match the crest on the front fender. 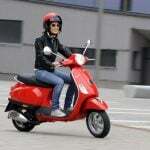 Piaggio is producing two versions of the GTS. The base GTS and GTS Super come with the 278cc single-cylinder four-valve engine claiming 22 hp at 7500 rpm and 16 ft-lb. at 5000 rpm. 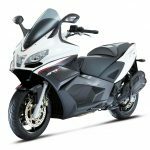 In Europe, the Super version is also available with the 124cc version that claims 15 hp at 9750 rpm and 8.9 ft-lb. at 7500 rpm. American consumers will likely only be offered the 278cc engine. 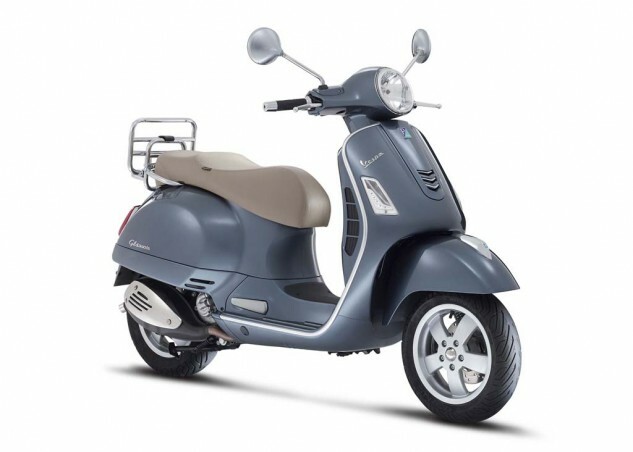 The Vespa GTS is available in Nero Vulcano black, Blu Midnight blue and Girgio Dolomiti gray, all with a beige seat. 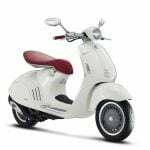 The Vespa GTS Super version gets a black seat with white stitching and is available in nero Lucido black, Montebianco white, Rosso Dragon red and Blu Gaiola blue. The Super version also gets black wheels, a different “tie” design, different front fender moulding and red suspension springs. 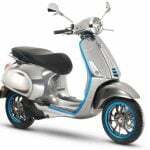 Other highlights include LED daylight running lights, a trapezoidal digital instrumentation, 2.5-gallon fuel tank, 12-inch wheels and underseat storage designed to fit Vespa’s new Visor 2.0 helmets.